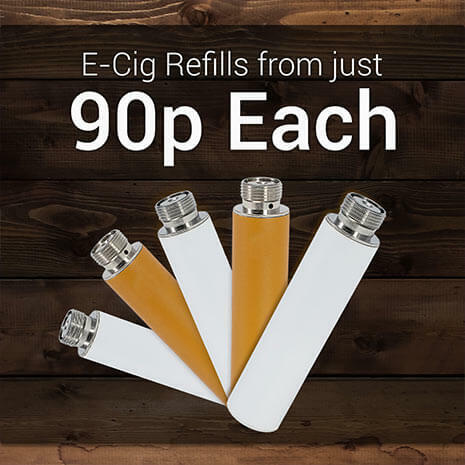 E-Cig Refills From Just 90p Each! One of our competitors have recently reduced the size of their refill packs from 5 per pack to just 4. The price is the same as before and, at £7.99, this pushes up the cost per refill from £1.50 to nearly £2 each. OK Vape’s e-cig refills are for sale on our website in packs of 5 for just £6.00. This makes our refills just £1.20 each – nearly 50% cheaper! If you buy in bulk, our multipacks can make the price per refill as low as 90p each! Sign up to our newsletter and we’ll give you 20% off your first order with OK Vape, as well as keeping you up to date with our latest offers. Save 10% – Build up Loyalty Points! To thank our valued OK Vape customers, we run an excellent loyalty rewards scheme for anyone who holds an account with us. Collect 1 point per pound spent on any full-price order and when your balance reaches 100 points, you can exchange them for a discount code for 10% off! Find out more. You can also save a further 20% off any time you recommend a friend. To sweeten the deal, your friend will also get 20% off! Click here to email an exclusive referral link to a friend. They’ll then receive their discount code and once they place their first order, you’ll be sent your very own 20% discount code. Save Even More – Free Delivery on Everything! We don’t want you to worry about how much it costs for our vape products to reach you, so we offer free Royal Mail First Class deliver as standard on everything. We ship throughout the UK and aim to dispatch all orders placed before 2pm Monday to Friday the same working day to ensure that you get your order as soon as possible. Find out more. « Feeling the Love from OK Vape Customers!